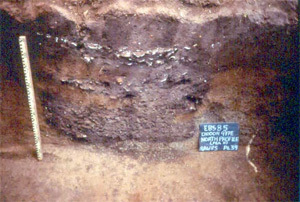 Zooarchaeological materials from the En Bas Saline site, located in present day Haiti, are the primary focus of dissertation research by Michelle LeFebvre. En Bas Saline is a particularly unique site in the Caribbean as it contains sequential pre-Columbian and historic components. A long term research site of FLMNH Curator Emerita Dr. Kathleen Deagan (Deagan 2004), En Bas Saline is a large Chiefdom-level village with a rich archaeological record of Taino life right up to the time of European arrival. Michelle analyzed curated faunal samples from En Bas Saline housed in the Historical Archaeology Range at the Florida Museum of Natural History to expand on early research completed by Dr. Elizabeth Wing (Wing nd.). With specific interest in the pre-Columbian component, her study explored daily and/or periodic social activities involving food at En Bas Saline through an intra-site analysis of variability in fauna using quantified evidence and identification of different activity areas. 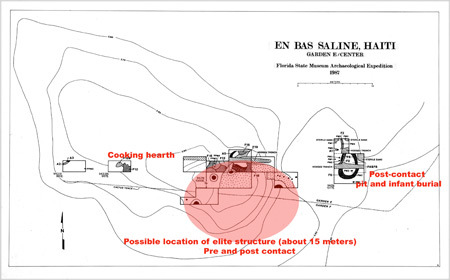 Visit the En Bas Saline website to learn more about the project. Deagan, K.D. 2004. Reconsidering Taino Social Dynamics After Spanish Conquest: Gender and Class In Culture Contact Studies. American Antiquity 69(4): 597-626. Wing, E.S. nd. Report on File Florida Museum of Natural History.